Roborovskis grow to about 4 - 5cm long, have bullet shaped bodies and very long hind legs for fast running. On this website, you can find much of the information you need to know about acquiring, taming, housing, feeding, sexing, naming and breeding Roborovski's. Robs are extremely active, making them somewhat difficult to handle, but certainly entertaining. In addition to a wheel, they like several hiding places and things to climb on. Due to their small size they can be difficult to keep in wire cages. In the wild their burrows can often reach as deep as 2 meters! The Rob is a very clean animal. It spends much of it's time with grooming itself. 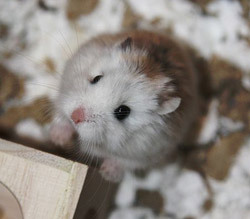 A Roborovski hamster will be particularly please with a dust bath. 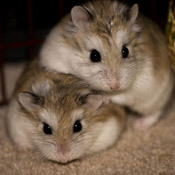 Dust bath designed for Chinchillas is too fine, but commercial hamster litter is inexpensive and works great, just put some in a bowl and watch them go! 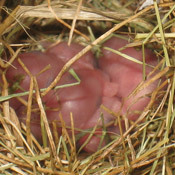 Female Roborovski's enter the oestrus cycle every 4 days. They remain fertile for a period of 12 hours in which mating can occur. That is, if the male manages to catch the female which can prove to be quite a challenge for him. The female can produce a litter every 4 weeks or so but seem to limit themselves to about 3-5 litters in succession.